Founder of the fabulously successful Conservative Home website, Tim Montgomerie, has kindly agreed to speak at the next Curzon Supper Club event on 7th November 2010. 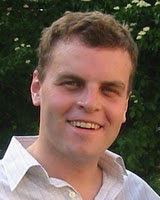 Tim studied at Exeter University and started the Conservative Christian Fellowship in 1990. He went on to work for the Bank of England before becoming Iain Duncan Smith's chief of staff in 2003. Tim became a major influence on IDS's theme of 'Compassionate Conservatism' and in 2004 was jointly responsible, with Duncan Smith and Phillipa Stroud, for setting up the Centre for Social Justice. Tim started Conservative Home prior to the 2005 General Election. It quickly became hugely popular with grassroots Conservative members, activists and supporters and continues to go from strength to strength. Tim has become firmly established as a leading Conservative thinker, commentator and expert on Internet based campaigning. He regularly appears on the BBC, Sky TV and other television and radio channels as an expert and pundit. The Curzon Supper Club event on the 17th March was a brilliant success! Ed Vaizey not only entertained a capacity crowd with his great sense of humour, but also having got just a whiff of an idea that a competition is emerging between speakers at the Curzon Supper Club (based on who can answer questions for the longest time!) Ed determined to win..
After a mammoth Q and A session covering a huge range of different issues he was duly crowned and applauded! There's a small video clip below here which records Ed's early explorations of the breadth and diversity of his portfolio. However due to fading light, the later amusing exchanges will have to live on solely in the minds of those who attended the evening.. Thanks to all those who helped make this a great evening. Ed Vaizey, Member of Parliament for Wantage and Shadow Minister for the Arts is confirmed as the next speaker for the forthcoming Curzon Supper Club event on Wednesday 17th March, 2010 at 7.30pm at the Half Moon Pub in Windlesham. Ed was elected to Parliament in 2005 at the same time as his close friend Michael Gove - they were 'best man' at each others weddings! He started his working career in the Conservative Party's Research Department, where he worked for 2 years before training and practising as a barrister. In 1996 he left the law and became director of a successful PR firm before working as a speech writer for Michael Howard MP in 2004. Ed has built a considerable media profile writing regularly for The Guardian and appears regularly on Sky TV's The Wright Stuff where he has been described as both Shadow Minister for Fashion and Shadow Minister for Video Games! The clip below shows Ed talking about the forthcoming Olympics in 2012 - yet another component of his exciting portfolio.